Moofore’s house and garden is one of my favorites in the whole area. His steep yard drops away on three sides, showcasing a wild panorama of the surrounding mountains and valley rivers. It is still the only place I’ve been where both the village of Mibu and the village of Beng can be looked down upon from one single spot. It makes me happy to think of Moofore here, on top of his local world. Because of the severe deformity of both his feet, he seldom leaves his own yard. When the Gospel was first presented here 5 years ago, we stood by and watched with amazement as God turned almost every adult to Himself. But there were some who did not believe. Moofore was one of them. I’ve gone to visit with him twice since coming here a few weeks ago, and today the conversation touched on spiritual things. This was the first time I have seen evidence of concern for his own sin and status with God. He asked about overcoming the real problem of sin and its penalty. At that point, I asked if we could pick up the conversation again in a few days, and asked him to keep thinking about that very question, and to ask others what their thoughts are. (After hundreds of conversations about this, I know there is a lot of good understanding out there.) I told him I’d visit again in a few days, and would like to ask you to pray with me for Moofore before we continue. Might this be his time to understand and believe the Gospel? /wp-content/uploads/2016/03/animated-logo.gif 0 0 Joey and Brooke Tartaglia /wp-content/uploads/2016/03/animated-logo.gif Joey and Brooke Tartaglia2011-07-12 14:33:062016-05-12 16:35:04Is It Time? We sat in church in Mibu on Easter listening to the Mibu Bible teachers as they led the service. They took verses on the death, burial and resurrection of Christ, and related it not only to the Easter story, but also to our everyday Christian walk. They taught carefully verse by verse, bringing big smiles to our faces as they seamlessly switched between teachers, and involved other believers in reading the verses out loud. That they had carefully thought about and studied beforehand was obvious. We felt in some ways like proud parents as they dug deep into the verses and sought to use them to build up the church. Benny, who is not a church leader but is a community leader, stood after the service and gave a wonderful illustration. He said, “It is just like a peanut. When we put a peanut in the ground, it does not produce just one, but many more peanuts. When Jesus died and was buried, did it stop everything? No! He rose again and now there are many, many children of God because of what He did. It is the same in our own lives. When we see ourselves as having died with Christ and dead to sin, God will work in our lives and use us to spread the gospel into the nearby areas, and further into the rest of the world.” We are very excited that one of the Mibu teachers’ goals is to keep training more guys to get involved and teach, so that they can teach others, and reach the next generation of the Mibu church, as well as the surrounding communities, and the world! After 17 weeks of foundational teaching through the Bible in Yongem, the Mibu teachers have presented the gospel to the village! The response to God’s Word was phenomenal, and a new church has been born! The Mibu teachers have been listening to the testimonies of the new Yongem Christians, and bringing back wonderful reports. Their enthusiasm is so contagious! They reported to the Mibu church that just a few days after the gospel was taught, a man named Alfons died of sickness. The teachers shared with the baby church from John 14:1-7, and that Alpons is already now experiencing all that they have just been learning about heaven and being with God. Jemsnannya, one of the new believers, stood and said, “Before, when someone would die we were without hope and used to follow our ancestors customs, like spitting to the sun. But now is the beginning of the harvest of our people going to heaven.” Once again, God’s message of hope is changing lives. The Mibu teachers plan to continue to meet with the Yongem church and teach a short review of the Old Testament, and then the book of Acts, and ultimately the whole New Testament. 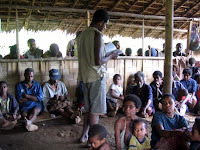 During that time they are making plans to take some of the Yongem men and begin to train them to be part of an outreach team to 2 other Mina speaking villages! Seeing the gospel go out and multiply like this just blows our minds… thank you so much to all of you who have been a part of this amazing journey with us. The team of evangelists from the Miboo church continue to tell God’s story in Yongem. The Yongem people are learning about God’s mighty power as seen when He brought the people of Israel into Egypt and miraculously back out again. During another lesson, the teachers put on a skit depicting a court session. During the session, several people offered a version of what happened in a crime, but it was only the testimony of the eye witness which was valid. Afterwards, David stood up and explained that we all have our own thoughts and beliefs about God, creation, and history, but God’s testimony supersedes our thoughts because He was eye witness to these things. Dreams, things our ancestors taught us, and our own concepts of God are all surpassed by the testimony of God’s word. God’s Spirit is at work convicting the people of Yongem of their sin and of the truth. Markoos, a man who had been resisting the teaching openly by distorting the truth, humbly proclaimed publicly, “I have no further objections. I will only ask questions when I’m confused, but no longer to oppose or distort.” The teachers selflessly spend hour after hour after the lessons are over, explaining and re-explaining the lessons to those who have questions. The three groups in various stages of accepting and denying the Bible truths have melded into a more unified, open and seeking group. Praise God! Bapeke, a former idol worshiper, now teaching the Word of God to the people in Yongem, stated fearlessly, “Before I used to go into the clan house and participated in many different customs. I discarded it all, and now have joined myself to the word of God. This message is the only way, and you should believe it. Listen to the message and decide for yourselves.” The response from the Yongem people was total silence, which in this culture is indicative of heavy conviction. The Bible teachers have seen the importance of being direct in their communication, and in wisely contextualizing the message to their hearers. When David taught a point on Jacob and Esau that he knew would easily misunderstood, he presented gently but plainly, “When the Bible says, ‘Jacob,’ its talking about a person. If it was talking about afterbirth, it would have said, ‘afterbirth.’” Making these clarifications are necessary for good communication, and so worth the time. The response from the people in Yongem after hearing about Jacob and Esau was one of conviction. A bunch of us crowded into Keteng’s hut to hear the outreach team talk about progress of the outreach so far in Yongem. Looking around the room, I watched people absolutely riveted on Devit, Yooyooro, Lookas, and Jems as they recounted this last week’s events. For 2 hours they shared how things are unfolding as God’s word is being taught in Yongem. Excitement and gratification were written all over the faces of the people listening as the outreach team reported specific individual’s responses. They leaned forward at the mention of each name as they learned how their relatives are responding to God’s truth. The team reported that people are falling into 3 groups – the allegorizers, the easy life seekers, and the those that are understanding the heart of the message. I found it fascinating how different Mibu people could identify with each of the three different groups, having been there themselves just a couple of years ago. In response to people’s hang-ups and objections, they kept saying things like, “The Bible lessons will address that in a later lesson, they will understand.” It was so cool to see how they could relate. So far, the teaching has gone up to the Cain and Abel story. As the Mibu Bible teachers teach, they communicate these accounts as being actual historical facts. But the first group, the allegorizers, try to find some hidden meaning in what is being said, rather than accepting it at face value. For example, because of the fertility cult mentality here, the story of Cain and Abel was interpreted as an allegory of the process of giving birth. Cain represented the child, and Abel the afterbirth. Cain killing Abel was akin to the cutting of the umbilical cord. Please pray for the people that are allegorizing in this way. They completely miss the point of the lesson as they try to find an applications for having more children, better producing gardens, and more success in hunting. Pray that they would learn to accept it for what it says. We have watched many Mibu people come out of this system of thinking, and are confident that it can be done. The second group is the easy life seekers. 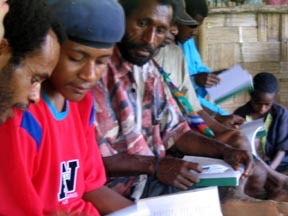 These people are following along in the teaching and accepting the truth of the Scriptures. However, the biggest hang-up for them is that their expectations are much more temporal. They are hoping that by attending and understanding the Bible teaching, somehow it will cause them to have an “easy life” like they see in town, complete with electricity, no garden work, money for groceries at a store and time to sit around and do nothing. Having come out of this type of dreaming, many Mibu people are very optimistic about their relatives in Yongem eventually understanding the heart of the message, coming into a right relationship with God. Please keep praying for this group that they would be convicted of their sinfulness and learn how to get right with God, not so that they can derive a temporal benefit, but an eternal one. Lastly, there is also group of people who are accepting the teaching at face value. They are concerned with their sinfulness in the sight of their creator, and are looking to hear about the provision that He has made for them. A very old man named Daidai said, “This is the very first time I’ve heard this.” Another man, Joel, said that he has never heard the Bible stories in this light before. According to the teachers, their questions indicate that they are following along and really understanding. How exciting! As the lessons progress, there will be many opportunities for the teachers to address the hang-ups that people are facing. Please pray that those who are hanging on to their non-biblical world view would be able to see through it and understand God’s point of view. Also, please pray for me and my family as we head over to Yongem tomorrow to spend a few days with the outreach team there. A small group of ladies and children sat on the hill up from our house talking about Mata. I had been friends with Mata, but hadn’t seen her much since she married into another village a few years back. The news had come from that direction that she was very sick, and not two hours later another messenger brought the news that she was gone. The news hit hard for Joey and I, knowing that she had moved away before the Bible teaching had happened here. She had not been able to come, living with her new family in a village several days hike away that speaks a different language. Times like these feel so crushing…. I sat on the hill and chatted with the ladies, talking about Mata’s little son, and who would take him now. I lamented that Mata had been gone for the Evangelism lessons. Mata’s Aunt Eson peered into my sad face with her steady dark eyes. “But she did hear,” she told me. “Last time she visited, she was staying with her parents. I told her God’s story. Her brother, Mark, also spent time telling her what God’s Words says, just how like we learned in the Bible lessons. We told her, and she believed. She is with God now. I miss her, but we will see her again.” How wonderful to hear that the Gospel goes forth, not just trained teachers outreaching to entire communities, but individual believers passing on what they have learned as they see need and have opportunity. Eson and Mark and so many other believers here know the truth, and reached out with it to Mata. Our tears have turned to joy. Thank you everyone who is praying for the believers here; rejoice with us!